Lately Briar has been preoccupied with the idea of growing up. She seems convinced that by doing so, I will somehow cease to be her mom. 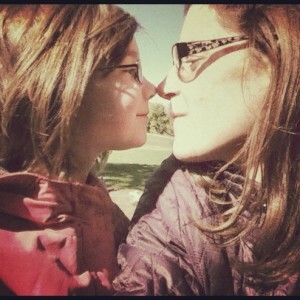 Last night we talked, nose-to-nose about what growing up really means. I tried to explain that as she gets older she won’t want to spend time with me. She rolled her eyes, as if. I tried a different tack. “You know how you helped me rake leaves today while your sisters played out back? That was incredible and it was very grown up. As you grow up, we’ll keep doing that—discovering new things together.” I watched her as she considered it. No go. She took a breath. I watched her perfect, little face begin to crumple. “I am? I’m funny?” She asked, beaming with a bright red, sniffly nose that looked exactly the way it did when she was a baby. I rubbed her back until she fell asleep and then as I slipped out my own tears came. There are so many things happening in our world right now that make absolutely no sense. My heart aches for a NYC family. There is no way that any news report can ever make sense of what has happened. I don’t want to believe, can’t seem to stop my mind from thinking of it, but what I can do is stop feeding the monster. Let the family rest. Let the story not become another 24/7 blaring, dehumanizing mess. Sometimes the only thing to do is cry in reverence. I have got to stop reading these before work. Oh, Amanda…Briar is just like my son! He cries when he talks about growing up and leaving home, and that’s exactly it. It’s just so tragic. I’m going to try to remember your words the next time we have one of these “I don’t ever want to grow up and leave you, Mommy” conversations. Mmm, they are so unencumbered by shyness or thinking they should feel a certain way. It’s beautiful. This was not the right day for me to read this because I’ve been teary already all morning but it’s so sweet and lovely. Being a mom is constant mourning of times that won’t last except in our hearts. And a constant celebration. What a blessing to have these sweet creatures who keep emotions so potent and experiences so rich. I love how you always write as though your are printing your heart on the page. I look at my ten year old daughter and am sad sometimes because I know that she won’t be little much longer. But, then I look at my 16 year old daughter and what an incredible person she has become and realize that every stage is wonderful. I do worry, though, about forgetting what they were like when they were small. How you make me miss having daughters. I saw shimmers of my own tendency toward melancholy. Not a hopeless melancholy, more of an emphasis on the things that are so perfect that you literally need to mourn that they won’t last forever. That is exactly how I feel when the moments in life are just so perfect.